The people who work for your staffing agency represent you and the customers you support. It is essential to thoroughly screen applicants before sending them to any business for temporary or permanent assignments. If you employ someone who isn’t qualified, or who has a serious criminal record, that could cause difficulties, result in lost business and damage your reputation. Reduce your risk by running background checks that confirm an applicant’s identity, verify their work history and reveal criminal records. Most staffing agencies provide coverage for a large variety of industries. In some cases, you may need background checks that are specific to the requirements of a particular client. Backgrounds Online makes it easy to create Custom Background Checks. We offer highly flexible screening options that can be tailored to suit any position. Build a background check and save that package so it can be used again to screen future employees. Our staff is here to help if you have any questions. Your customers have urgent, ongoing hiring needs. To fill their requests, you’ll work with a large number of people. That involves regularly interviewing and onboarding applicants. The staffing industry also faces a rapid turnover rate, so agencies are constantly looking for new candidates. A background check is a smart investment. Screening people shows you if they have something on their record that disqualifies them from some or all of the positions you must fill, and helps you avoid costly hiring mistakes. While screening people who will work for your clients, all the standard compliancy rules apply to your background check process. You will likely have numerous applicants, so it is imperative to remain in full compliance with FCRA and relevant state laws. Backgrounds Online provides an extraordinarily flexible platform that accommodates all of your screening needs. We are FCRA certified and have dedicated account managers who are happy to answer your background screening questions. Do I need to screen people who will only fill temporary positions? A: While you are not legally obligated to screen temporary employees, these individuals will represent your brand and be called upon to work for your customers. Best practice is to screen each person before deciding whether or not they are eligible for such positions. This helps protect your company and the clients you serve. 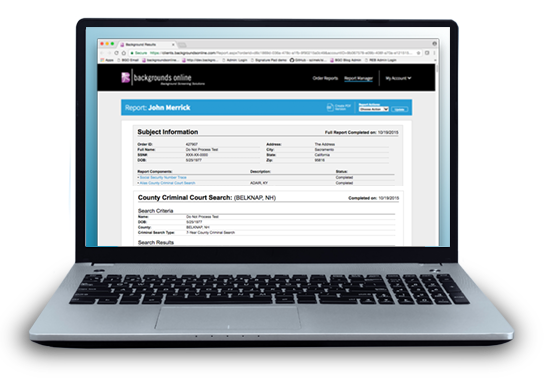 Background checks confirm the identity of an applicant, show you if a person has a criminal record and give you the information you need to make educated hiring decisions while remaining compliant with federal and state laws. Is drug screening required for people who work at staffing agencies? A: No, but in many cases they are advisable. Backgrounds Online provides 5, 10 or 14 panel Drug Screening services. You can add Drug Screening to any of our existing packages, or create your own custom background check that is tailored to your specifications. What type of screening should I use for full-time employees who help find workers for my customers? A: People who are in charge of finding temporary workers for your customers will be asked to communicate with a large number of individuals and businesses. They may also have access to sensitive data from both clients and temporary employees. We recommend a Custom Background Check that is tailored to the position. Our staff is skilled at developing these screening packages, and happy to assist you. For more information, please contact us. When should I include a Motor Vehicle Record Search with a screening package? A: We recommend this for anyone who will drive while on duty. This is especially important for people who will transport others while representing your company. In some cases, you may be called upon to fill positions that require operating large vehicles. A Motor Vehicle Record Search shows you whether or not a worker has the required license for any type of vehicle they are asked to operate. Rely on these reports when you need to verify license status or class, check for infractions or see an accident history for any worker. Staffing agencies work with numerous people to facilitate their customer’s employment needs. Backgrounds Online provides fast and thorough screening services for all the applicants you are considering.